The road to women’s rights has not been smooth. It has been disjointed in battles for the right to vote, gain equality in virtually every area of employment, earn equal pay, gain the right to choose and be viewed with respect. Currently, The Prospect Theater Company presents the world premiere of The Hello Girls, at 59East59 Theaters. 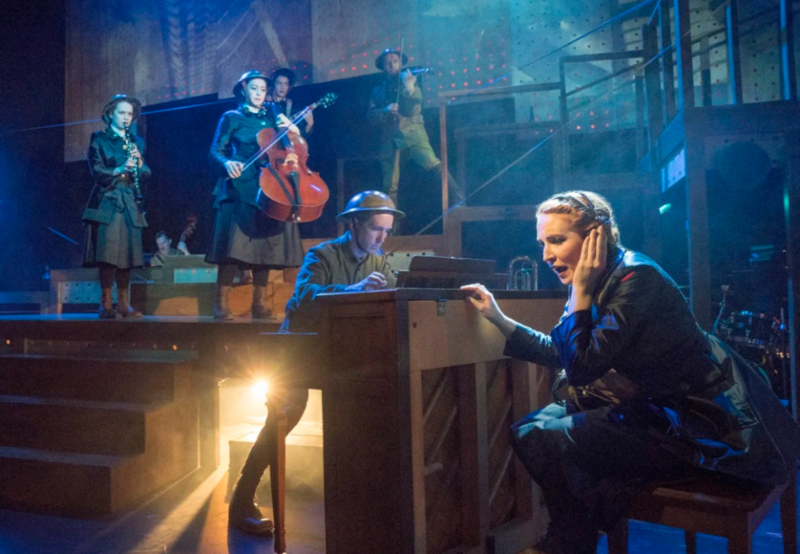 This off-Broadway musical featuring book by Peter Mills and Cara Reichel with Peter Mills’ music and lyrics takes us back 100 years to World War I, when a group of women officially joined the US Army. 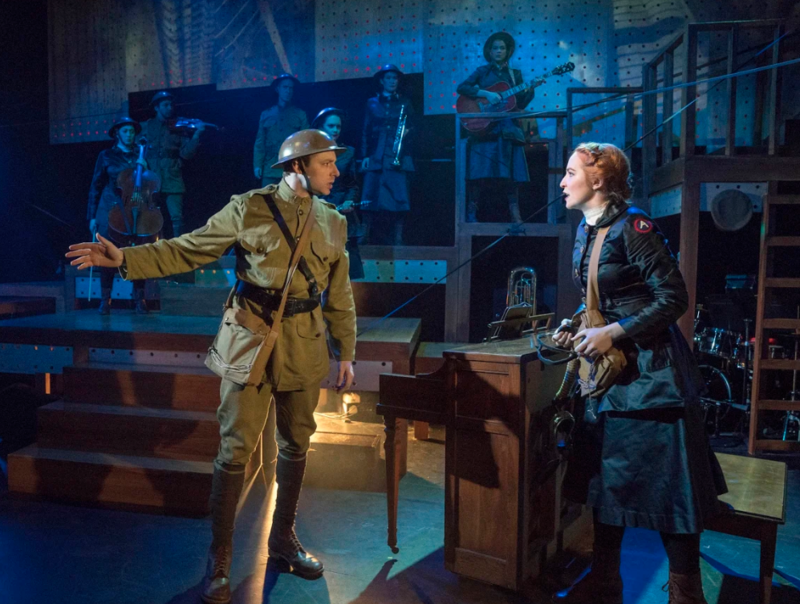 Singing at the top of the play, “A world drifting toward tyranny…/A world where nationalism is on the rise…/We’re talking about the year 1918, of course,” the words sound chilling and relevant to 2018. This chapter in the history of women’s right, pairs historical research (like Elizabeth Cobb’s, The Hello Girls: America’s First Women Soldier) with engaging theatricality. While 223 women were actually part of “Black Jack” Pershing’s female contingent at the switchboard, playwrights Mills and Reichel trimmed the play to five young women who, in 1918, decide to join the U.S. Army Signal Corps. Their reasons are varied, patriotism, the lure of adventure, and combating loneliness, with one woman who has a husband already in France, another is a French-born American. The women buy their own regulation uniforms, undergo physical training and medical examinations. They take the Army oath, are trained by Bell and then sail to Europe and based near the front lines of the Battle of the Argonne Forest. Their job is connecting telephone calls between French and American officers and remaining on the line for translations. They are privy to security secrets although ironically back home, it would be another two years before they would have the right to vote. Act One moves briskly, set in short scenes leading to Europe with an energetic ensemble of four talented women, skilled instrumentalists and singers. Only the leader of the squad, Ellie Fishman as Grace Banker, sings but does not play an instrument. Her acting takes charge, showing grit and defiance., At one point, Grace alone refuses to leave her post which had caught fire. When the fire was put out, she brought back her squad and they continued with the calls. This act of bravery received no acknowledgement until 1977 until President Jimmy Carter awarded her the Distinguished Service Medal and The Hello Girls were officially given veterans status. Captivating is Cathryn Wake playing Louise LeBreton (clarinet), a young, spunky French-born operator who is determined to join even though she is only 17. Chanel Karimkhani as Helen Hill (cello), is a timid mid-Westerner who never left her town but is persuaded to take a chance. Lili Thomas (brass and piano) plays Bertha Hunt, who joins up to keep busy while her husband is overseas. Skyler Volpe plays Suzanne Prevat (guitar) who is lured by adventure and romance. Men are the supporting players. A major part is percussionist Arlo Hill as Lt. Joseph W. Riser. (Elena Bonomo is also percussionist but is not a cast member). Andrew Mayer duplicates in several roles, including Pvt. Dempsey. Also playing duplicate roles is Matthew McGloin (accordion and piano) as Pvt. Matterson and Ben Moss (piano and music director) as Lt. Wessen. Scott Wakefield (bass) steps forth from the back as Gen. John Pershing. The uneven road to women’s rights, while not smooth still moves forward. The Hello Girls celebrates another segment of women’s contribution to American history and how these women answered the call when needed. Unfortunately, they had to wait almost 60 years longer for the veterans status they were due, including benefits including disability and bonuses. At 59E59 Theaters, www.59E59.org, Lianne Arnold designed the nostalgic set with assorted musical instruments with lighting by Isabella Byrd and sound by Kevin Heard. Appropriate period costumes are by Whitney Lochner. Through December 22, 2018. Run time two hours, 30 minutes. One intermission.